sometimes, halloween is about… indulgences. the holiday gives you free reign to dress up as whatever you like. a vampire, a ghost, a zombie…. anything that tickles your fancy. so today, it’s actually my best friend who inspired these costumes. bff vivi is *all* about the anime, so when we found a few key accessories on the marketplace..
…i knew i’d have to indulge her, just a li’l bit. these mesh heads from utilizator are all kinds of awesome — i’m wearing the regular female version but vivienne is wearing the *chibi* style (and is so cute i could scream x3) — and are chalk full of options. there are several facial expressions, including different mouth and eyebrow positions, as well as different eye styles and colors… and each come in three skin tones, with matching skins and head pieces, for tons of customization. these would be fantastic for cosplay in sl — emulating a favorite character from an anime or manga series would be a breeze with these head pieces — but they also work for making up your own types of characters like vivi && i have done. she and i decided to dress as close as we could get to *anime schoolgirls*, with her outfit coming from collabor88 by r2. when the collection rolled over at the beginning of the month && we saw these sailor suits out… vivienne and i both knew we had to do something with them for halloween. luckily for us, rei2 aya made some *fantastic* mesh pieces that were perfect for the looks we were going for and vivi looks so freakin’ cute in this outfit. mine, on the other hand, comes from monso… and i *love* it. the version i grabbed comes with a bunch of color options for every single part of the outfit — from the trim on the jacket to different styles and colors for the tie at the neck — and is wonderfully constructed. it was absolutely perfect for a schoolgirl look && i spent much longer than i’d care to admit, just pushing buttons on the HUD to see all the color combinations. while vivi went with a lunchbox (from love soul), i decided to wear a backpack.. one i’ve had from pink fuel for a very long time now. i’m glad i had it, it really came in handy for adding just that li’l extra touch to my costume, and i mean.. it’s pink fuel. and it’s a bunny. you cannot go wrong! i always tend to lean on the scarier side of halloween, but that doesn’t mean every costume has to be freaky ‘n’ blood-soaked. being super adorable works just as well, too! ps. 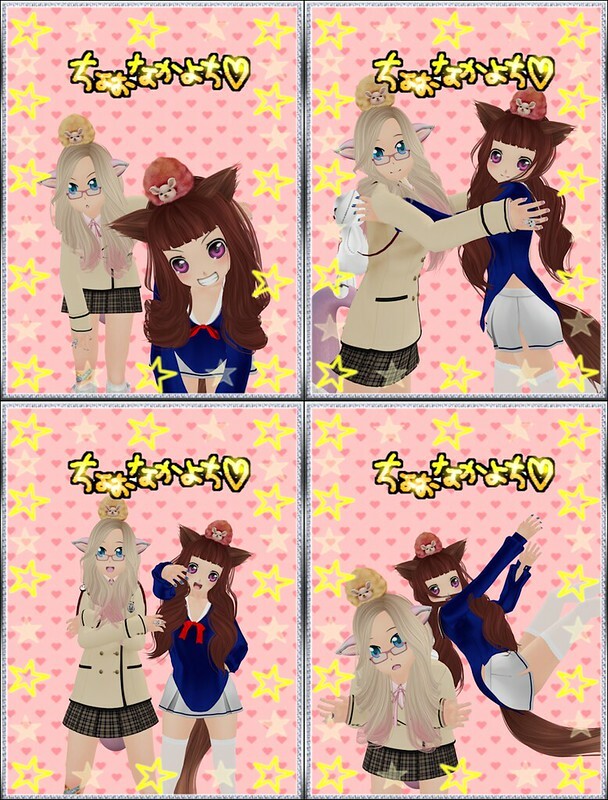 these last four pics were taken in a photo booth on the love soul sim… while they turned out adorable, i’ve no idea what the text says across the top of each panel (i just kinda mashed buttons on the dialog box until the backdrop was cute enough). here’s hoping it’s appropriate! so! i’ve done two looks for halloween (well, technically three if you count bff vivi too!) and today i have another one..
this look is surprisingly easy && inexpensive to put together, too, if you act fast! the ghostly white skin i’m using here is part of the gachas @ the arcade from glam affair && the current round is only up until the 15th (and that’s tomorrow!). but for a very small cost, you can try your luck at the machines… and there are several skintones available that’d work well for a zombie look! and all the bloody marks and clothing are from edelweiss… and are *free*! the bloodied school girl outfit — which includes legwarmers, socks, skirt, shirt, a bunch of bloody tattoo layers && even the static modeling poses i used in the second collage of pics above — is available on the group-only lucky boards. these pieces are mesh and really well-made which make the price ridiculously awesome. and the lucky letters flip over rather quickly! and the group is free to join! *so* worth a stalk if you need a good halloween costume for cheap! this costume was so fun to put together — and lots of fun to wander around in, too. so fun, in fact, that i took a li’l video of me bein’ all creepy ‘n’ stuff on the sidewalk. can you tell how excited i am for halloween?